At Micro-Easy, we offer training classes for the most popular IT certifications in the industry. Led by veteran IT professionals, we prepare each student with the knowledge needed to pass their exams the first time. The process of enrollment is simple. 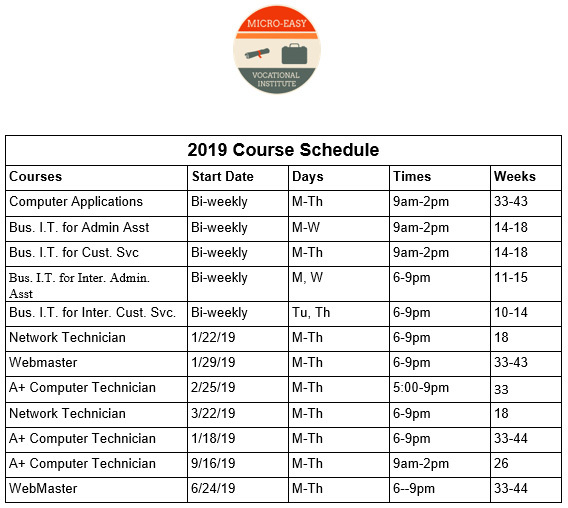 We make it easy for those who are interested in advancing their career in the IT industry to enroll and begin the journey of becoming certified professionals. Why Choose Micro-Easy Vocational Institute? It’s our priority to ensure the success of each student through a fun, yet highly educational experience. Working together, it’s our goal to help expand your mind with the technical know-how of tomorrow.